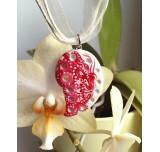 Eco Handmade Clay JewelryThere are 23 products. Eco handmade clay jewelry is ooak, designer jewelry made of natural clay which I used to create original, useful and very beautiful pieces of eco clay rings, bracelets, earrings and necklaces. 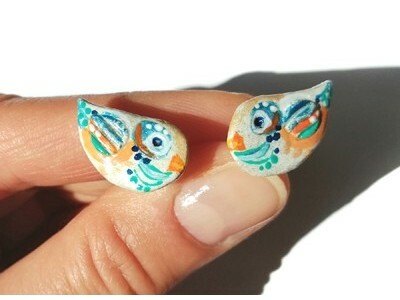 The eco clay jewelry is handpainted with acrylic colours, all patterns are unique and original, which makes this handmade clay jewelry even more unique. I also added some nickle free silver-platted parts and yarn to make it look even more special. This eco handmade clay jewelry makes a perfect, original and unique gift for women who like natural materials even for timeless jewelry. Eco handmade clay jewelry - a lovely handmade ring with a lovely seahorse tail motif and turquoise handpainted details represents a very unique gift for women who like noticeable,special and practical jewelry made from natural materials. IMPORTANT! 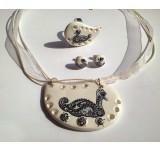 Before purchasing this clay jewelry register/log in to e-store Unikatnica.